Radio City, India’s leading radio network, decided to disrupt the regular programming of the station in reaction to the fuel price hike in Delhi and Mumbai cities. The ‘funhit mein jaari’ campaign, ‘Tel Lene Gaye’ is a disruptive, one day-long activity held on 11th September in Delhi. All the RJs of Radio City Delhi - RJ Ginnie, RJ Divya, RJ Yuvi, RJ Aadi RJ Manav - were off-air because ‘Radio City ke RJs Tel Lene Gaye’. Radio City Mumbai is also replicating this disruptive campaign with RJ Salil, RJ Archana, RJ Palak, RJ Harshit, RJ Pulkit and RJ Karan, on 12th September. The idea is to portray the frenzied way in which people rush to get fuel after the prices shoot up every now and then. Although Radio City played the maximum music during the activity, the campaign created quite a buzz amongst the listeners who missed their favorite RJs on-air. An overwhelming number of calls have been coming in from across both the cities. 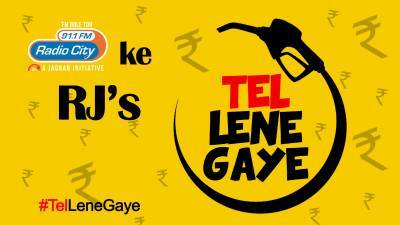 Following the no-jocks-on-air day, Radio City Delhi is hosting a contest for the listeners wherein the winners are being given fuel vouchers as prizes. Radio City believes in humorous but relatable campaigns to create the desired impact on the listeners and will continue to do so with activities like this one.